Offer valid in selected groups for pick-ups until 15/12/2019 except those bookings that include some day within the period from 12 to 20 April and between 15/07/2019 and 15/08/2019 inclusive. In the list you will be able to see the groups that enjoy the promotion marked with the seal that appears in the advertising banner, but that price will not have applied the discount yet. In the last step of the booking process, when calculating the final price of the vehicle, the corresponding discount will be automatically applied, which will be the price of a booking of one day less by choosing from 4 to 14 days and two days less if you choose from 15 to 30 days (the offer is only valid for a maximum period of 30 days). For example, if you search for a group for a period of 10 days, you would pay the price for 9 days of rent, and if they were 18 days you would pay the price for 16 days of rent. This offer will be valid for a limited time and will only be applicable if it is published on the Marbesol website, except for typographical or translation errors. Marbesol is a car hire company based in Malaga airport (AGP) and Marbella, allowing you to book and drive your favourite car brands throughout the Costa del Sol in the south of Spain. Benefit from cheap yet top quality car rental in Malaga, whether you are living, spending your long-awaited holidays in Andalusia or simply need to hire a vehicle for a quick trip. Besides, hiring a car lets you explore new routes, enjoy the nice weather and discover the best areas of Malaga for sightseeing. When visiting Malaga car hire will save you money and time! Waste no more time of your holidays and choose your next travel destination. As soon as you pick up your Marbesol car or mini-van and drive out from Malaga airport, the road will be yours. Torremolinos, Fuengirola, Mijas, Benalmadena, Marbella, Torrox, Nerja are only waiting to be discovered. a medium-sized car which is easy to park, such as Fiat 500, Volkswagen Polo, Skoda Fabia, Seat Ibiza and similar brands. an impressive luxury model, from classical to sophisticated, such as Ford Mustang, Porsche Cayenne, BMW Serie 2, 3 and 4, Mercedes Clase C, Audi A5. Our top-notch fleet of rental cars is constantly renewed, to ensure that our customers enjoy a comfortable and personalised experience. If you are passionate about automatic vehicles or like to spend the weekend away with your friends on a mini-van, Marbesol provides you with the best car models to hire in Malaga or Marbella. 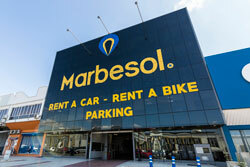 Why book your cheap car hire in Malaga Airport with Marbesol? Last but not least, Marbesol car hire Malaga holds a variety of packages and prices that adapt to your budget and own personal needs: these are the Basic Package, Plus Package and All-Inclusive Package. Depending on the booking fare, you will have access to some more service benefits such as full insurance, no excess, no deposit hire, full-to-full policy and a free extra driver. You can pay by credit card using VISA and Mastercard. Should you be interested in getting the latest news on promotions and discounts from Marbesol, please subscribe to the exclusive Marbesol Club! Start planning your next trip to the Costa del Sol, find your favourite car on our website and book a cheap malaga car hire service with Marbesol.